Provides an early warning to the operating surgeon. Facilitates prevention of permanent damage to the nervous system. If your patient must have spinal surgery, this section explains the IONM process and how surgical monitoring can benefit both you and your patient. You may also want to visit the FOR PATIENTS section to review the information provided to patients facing surgery. Intraoperative neurophysiological monitoring (IONM) is a real-time assessment of neurological function involving the brain, spinal cord and related nerve structures. Complex, multi-modality IONM facilitates the surgical process and reduces surgical risk by enabling a neurotechnologist (NT) to alert the surgeon if and when spinal cord or neural structure compromise appears imminent. While Quantum Neuromonitoring specializes in using IONM for spine surgeries, we also monitor other types of surgical procedures such as craniotomies, total hip replacement and vascular procedures. IONM is provided in the operating room by extensively trained neurotechnologists (NTs) utilizing proprietary, turn-key computer systems. These professionals have broad knowledge of electrophysiology, anatomy and physiology as well as extensive training in OR and surgical protocols; fitting them with the tools to practically apply IONM. The NT is responsible for equipment setup, patient preparation for monitoring, recording electrical responses (the monitoring event), and the evaluation and documentation of data generated during the surgical procedure. When changes in the conduction of electrical impulses through the spinal cord or related neural structures are identified, the NT informs the surgeon and/or anesthesiologist so that appropriate intervention can be achieved. IONM helps facilitate successful surgeries by enhancing patient safety, improving outcomes and aiding surgeons and hospitals in providing patients with optimal care. Studies such as “Evaluation of Intraoperative Somatosensory-Evoked Potential Monitoring During 100 Cervical Operations” SPINE, Volume 18, Number 6, (1993) show that IONM has contributed to the reduction of neurological injury from 4 percent — 6.9 percent to 0 percent — 0.7 percent in scoliosis and cervical operations. In another study conducted to assess the value of monitoring during pedicle screw placement, “Usefulness of Electrical Stimulation for Assessing Pedicle Screw Placements” Journal of Spinal Disorders, Vol. 13, No. 4, (2000) over 15 percent of the subjects had a positive EMG response, indicating a potential neurological deficit. Allowing surgeons to safely operate more aggressively. Enabling hospitals to reduce risks and costs, and better utilize operating room time. Lowering payor healthcare costs by reducing the number of second surgeries, therapies, scans, and prescriptions. Most importantly, IONM helps patients experience a better quality of life through enhanced surgical outcomes. A biomedical computer is used to record impulses generated by electrical stimulation of peripheral nerves and dermatomes. Using the International EEG 10-20 electrode placement system, cortical needle electrodes are precisely placed su bcutaneously to record sensory responses at specific locations associated with the spinal column and along the course of related peripheral nerves. Data generated by intraoperative neurophysiological monitoring (IONM) provides a measurement of latency (time it takes for a nerve impulse to travel from a specific point of stimulation to a specific recording site), amplitude (strength of that impulse), and wave form definition. These recordings are called somatosensory and dermatome evoked potentials. Needle electrodes are inserted into associated muscle groups to monitor spontaneous and electrically evoked myogenic activity. Transcranial motor evoked potentials can be recorded from distal muscle groups to monitor corticospinal pathways. Cortical motor and sensory strip mapping have proven valuable for tumor removal. The neurotechnologist (NT) will monitor all structures that are placed at risk as a result of the surgical procedure, patient positioning or physiological variations. Knowledge of changes reflected in these recordings or the existence of a response in the case of EMG activity may help the surgeon protect the spinal cord and related neural structures, thereby reducing the possibility of a neurological deficit. Following a thorough chart review and introduction, the neurotechnologist (NT) applies multiple stimulating surface electrodes in the pre-operative holding area. Sterile sub-dermal and intramuscular needle electrodes are inserted after induction and approval of the anesthesiologist. This process is done such that preparation of the patient continues unimpeded. The type of surgery will dictate the number of attached electrodes, which can vary significantly from 15 to 60. 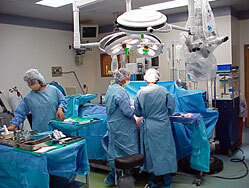 After the patient is brought into the operating room; he or she must be moved to the operating table. Once positioned, the NT can verify the integrity of the brachial plexus by stimulating an upper extremity peripheral nerve such as the ulnar nerve. If the brachial plexus is compromised, it may be necessary to reposition the arm or add more padding. The NT must be aware of any prior orthopedic procedures (e.g., joint replacement or joint fixation due to surgery or disease) that may limit or require modification of technique during patient transfer. The NT must be aware of all anesthetic agents administered, including the approximate time of administration and duration of action. Handling this situation diplomatically becomes extremely important, since cooperation with the anesthesiologist is imperative to insure the smooth monitoring of each surgical procedure. The operation moves into the actual surgical phase once the patient is anesthetized and positioned for the procedure. During this time there are brief periods when the NT can check the electrical integrity of the recording electrodes and obtain basic information relative to the nerve structures placed at risk. At various points in the procedure, information provided by the NT’s biomedical computer is most helpful to the surgeon, and the NT can make the strongest contribution to the surgery’s success and patient’s welfare. Anesthetic concentrations are monitored closely for their effect on the recordings that may persist for the remainder of the procedure. It is imperative that the anesthesiologist and NT work closely together to ensure that the most desirable combination of agents are administered to enhance patient safety while permitting the NT to obtain the best quality studies. Continuous monitoring alerts the NT to what may be happening as a result of anesthetic variations, as opposed to surgical intervention itself. This minimizes the chance of false positive findings during the surgery when increased concentrations of anesthetic agents cause the responses to cease (as in the case of EMG activity and use of neuromuscular blockade), or when latencies and amplitudes are prolonged and decreased respectively. Diminished blood flow to the spinal cord is detectable through changes in the somatosensory and motor evoked responses. Significant consequences can result if the NT does not alert the surgeon that a change has occurred. Standard pulse oximetry has proven valuable in detecting occluding emboli or atherosclerotic plaque during thoracic or abdominal approach to the spine. Once patient baselines have been obtained, it is imperative that the NT inform the surgeon and document any abnormalities observed (e.g., when latency of a dermatome evoked potential is delayed bilaterally or on the right side when compared to the left). As a result, the surgeon may be more aggressive as decompression is performed to ensure that a particular nerve has no additional impingements or is not compromised by an underlying pathology. The NT can thus provide useful information to aid the surgeon’s dissection and decompression. Knowledge of surgical procedures and instruments selected by the surgeon will inform the NT of critical monitoring junctures and required alterations in recording or stimulating techniques. Monitoring the particular modalities which may be most affected at this juncture in the surgical procedure becomes imperative. Make preparations for electrical stimulation of an implant such as a pedicle screw. Verify intensities to avoid injury to other nerve structures in proximity to the implant stimulated. Of course, ongoing communication between the NT and both the anesthesiologist and the surgeon remain critical. It is advisable to verify that adequate stimuli are being delivered by observing a muscle contraction, (e.g., the small finger for the ulnar nerve; the big toe for the tibial nerve). At closure, all needle electrodes that were placed in the sterile field should be shown to the circulating nurse or surgical technician. The nurse will verify that all needles are intact, the needle count is validated and non-reusable sharps have been properly disposed of. Standards, Recommended Practices, and Guidelines by the Association of Perioperative Registered Nurses (AORN) serves as an excellent reference manual. Continuous monitoring should be performed during the remainder of the procedure and throughout closure. The NT must be aware of any electrophysiological abnormalities that occur during closure because a condition could develop that would compromise the spinal cord. If the NT notices a change in evoked potentials at this point, a premature transfer of the patient to the recovery room could be avoided eliminating the need for re-intubation and surgical re-exploration. Online, real-time remote monitoring is the process of viewing the information generated in the operating room (OR), including wave morphologies and data, as it is recorded from an outside location. With the advancement of information technology, the supervising physician can view, interpret and communicate without delay. Conferencing software programs on the biomedical computer connect to the monitoring physician’s computer system; allowing the information to be viewed in real-time fashion both remotely and securely. Quantum Neuromonitoring NTs work closely with physicians trained in intraoperative neurophysiological monitoring (IONM) and who provide a supervisory function or professional component. A physician located outside the operating room monitors the majority of cases monitored by Quantum Neuromonitoring personnel in real time. The remote monitoring connection depends upon hospital authorization and Internet access. In difficult cases, constant communication between the NT and supervising physician increases the likelihood of pinpointing the cause of abnormal findings. The supervising physician can view and interpret tracings without delay. Remote monitoring can be accomplished from anywhere in the World, providing there is an Internet connection available. Therefore, patients undergoing spinal or cranial surgeries monitored by Quantum Neuromonitoring can be assured that the highest level of care is being employed at all times. Quantum Neuromonitoring strictly adheres to HIPAA security regulations. A two-factor authentication process maintains identification and authentication of authorized Quantum Neuromonitoring personnel. Encryption of data transmitted in each individual case is initiated at the Quantum Neuromonitoring server using a Secure Sockets Layer (SSL) protocol supporting 128–bit encryption. Intraoperative neurophysiological monitoring (IONM) provides many important benefits, chief among them is the ability of the neurotechnologist (NT) to determine what has caused a change in the information being recorded, or a shift from baseline as it relates to the surgical procedure. We call this the “Red Flag Warning.” Many factors are under the control of the anesthesiologist, but the surgeon and the NT can augment the information obtained on patient status through the monitoring process. In each case the problem must be corrected or the surgeon must be notified so that he or she does not continue the surgery with a false sense of security. High concentrations of inhaled agents, such as nitrous oxide, can minimize the ability to obtain somatosensory and motor evoked potentials. Inadequate time allowed for the muscle relaxants to wear off will inhibit the ability to monitor spontaneous and electrically-elicited EMG activity. Anesthesthetic-related factors can be minimized by a close working relationship between the anesthesiologist and the NT, along with an understanding of how specific anesthetic agents affect the various electrodiagnostics. Hypotension causes prolongation and reduced amplitude in somatosensory and motor evoked potentials. Increasing blood pressure will reduce the chance of an ischemic event. Hypothermia can be detected by the degradation of somatosensory evoked potentials prolonging recovery. Inadequate ventilation, causing hypoxia, will cause somatosensory wave forms to prolong as a result of oxygen deficiency. Inadequate blood flow to the spinal cord will cause wave forms to prolong. Having the patient’s arms extended or providing insufficient padding under the shoulder can cause stretching of the brachial plexus. Detection can be accomplished by obtaining an ulnar nerve somatosensory evoked potential. Cervical traction and hyperextension may cause a rapid change in the central conduction of the somatosensory evoked potential and an abrupt loss of the motor evoked potential. Spinal cord ischemia may occur as a result of improper positioning and can be detected by both evoked potentials. Neurological conditions such as ulnar nerve palsy, paralysis, muscle weakness, and sensory deficits can be avoided with early detection and followed by corrective action; such as repositioning the patient. Bone Graft Impaction or Migration: A bone graft impacted incorrectly in the cervical and thoracic spine can cause loss of the sensory and motor evoked potentials in addition to spontaneous EMG activity. Potential neurological deficits include (level dependent) quadriplegia, paraplegia, arm or leg pain with or without sensory deficits and muscle weakness. Corrective action: Remove and reinsert the graft. Excessive Retraction: May cause sensory changes consisting of prolonged latencies and a loss of amplitude due to the delicate composition of the cord and nerve roots. A loss of motor evoked potentials, especially in surgeries involving the cervical through the thoracic spine and first lumbar vertebrae, may also be evident due to excessive retraction. Spontaneous EMG activity can be specifically observed when retracting the nerve root. Potential neurological deficits include (level dependent) quadriplegia, paraplegia, arm or leg pain, muscle weakness, bladder or bowel dysfunction, and sexual dysfunction. Misplaced Pedicle Screw: Can affect the dermatome evoked potential and cause spontaneous EMG activity as a result of irritation to the motor component of the nerve root. Electrical stimulation is used to confirm placement. Potential neurological deficits include leg or arm pain with or without sensory deficits. Corrective action: When the screw causes spontaneous activity and/or the electrical stimulation causes a triggered response, the screw can be removed and redirected or removed completely. If the problem is left unresolved, a second surgery may be required. Cord compression: May be caused by an accumulation of blood in a confined space and could result in the gradual degradation of the sensory and/or motor evoked potential. Additional causes of sensory and motor degradation include: misplaced bone grafts, excessive retraction, and tumors around or within the spinal cord. Potential neurological deficits include: (level dependent) quadriplegia, paraplegia, and arm or leg pain with or without sensory deficits, muscle weakness, bladder or bowel dysfunction, and sexual dysfunction. Corrective action: Hemostasis (control bleeding); removal and reinsertion of the bone graft; reduce retraction; remove tumor. Ischemia: Vascular occlusion (lack of blood flow) to the spinal cord may have significant effect on the sensory evoked and motor evoked potential. In the thoracic spine, the cord receives blood, in part, through the radicular arteries following the course of the nerve root. If the neuro-foramina are compromised, ischemia will cause a prolongation of the latency and loss of amplitude. The motor evoked response may also be affected. Potential neurological deficits include (level dependent) quadriplegia, paraplegia, arm or leg pain with or without sensory deficits, and muscle weakness. Corrective action: Increase blood pressure; change the patient’s position. Excessive correction of a spinal deformity: Overcorrection of a curvature (e.g., scoliosis) may cause a loss of sensory and motor evoked responses. Potential neurological deficits include paraplegia, arm or leg pain with muscle weakness and/or sensory deficits, bladder or bowel dysfunction, and sexual dysfunction. Corrective action: reduce the distraction, compression and/or rotation of the spine. Tumors: May be intramedullary (within the spinal cord) or extramedullary (outside the spinal cord, but intradural, meaning under the spinal cord covering). Tumors may also be epidural (outside the dura) or paraspinal, generally involving the boney structures of the spinal column. Potential neurological deficits include sensory disturbances, balance and coordination difficulties affecting the ability to walk, weakness, paralysis, and bladder and bowel dysfunction. Corrective Action: Remove as much of the offending pathology as possible. Cervical traction: Used during surgery on the anterior cervical spine, the amount of traction varies depending on the size of the patient and muscular development, but is generally around 15 pounds. The purpose is to open the intervertebral disc space, which in turn allows better access to the offending pathology such as a disc herniation. Potential neurological deficits include paralysis, muscle weakness and sensory deficits. It is advisable to have a medical doctor trained in IONM for consultation if routine trouble-shooting does not lead to a logical conclusion. Through remote monitoring or direct supervision, the supervising physician can interact with the NT to provide an additional level of expertise. Frequently, causes of neurological changes will go undetected without having a means for measuring them in place. Using the IONM biomedical computer allows these changes to be detected.